Take Exit 14 off the M4, taking first left at the roundabout towards HUNGERFORD (A338), drive for about 4 miles and when the road ends, at the outskirts of Hungerford, turn right (after a petrol station). Go over the small bridge and after 100 yards turn right at the roundabout, opposite another petrol station, and thus bypass Hungerford. Drive for ½ mile and turn right onto the B4192 and stay on this road for 3 miles, passing through the village CHILTON FOLIAT. Two miles from Chilton Foliat and the first turn off on your left is signed RAMSBURY. This road takes you into Ramsbury High Street. Fork left at the large tree next to The Bell (pub) and follow to the end of the high street where the road bends to the right and almost immediately to the left. As you come out of this left hand bend, turn right onto Hilldrop Lane. Go up the hill, past three cottages on the right called Langfields. About 750 yards later you will see a farm entrance and a sign saying Hilldrop Barn and Shoot. The car park is immediately on the right hand side and the shoot room is adjacent to it. The map to the right may help. From M4 Exit 15, take the slip road to MARLBOROUGH (A346). Take 2nd left in CHISELDON and follow this road until you hit the B4192. Turn right towards ALDBOURNE. About 2 miles beyond Aldbourne take the right hand turning to RAMSBURY. Follow this road into Ramsbury Highstreet and see above for a guide into Hilldrop from the Bell. Postcode for Sat Nav: SN8 2HB. This will take you to three cottages called Langfields. Follow the road up the hill for a further 750 yards. 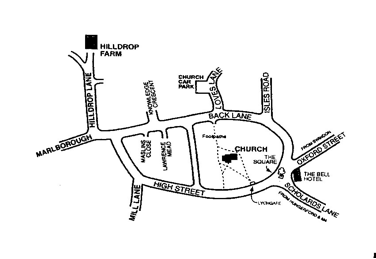 Take the second entrance into Hilldrop Farm, at the white sign post saying Hilldrop Barn and Shoot. Park in front of the shoot room- immediately to your right.